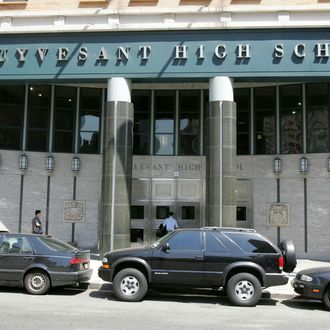 The city's premiere high school for kids who can't keep their eyes on their own test. Last month, a student at Stuyvesant High School was caught photographing his Regents exam with this cell phone and distributing the shots to dozens of his classmates. Officials now say that 70 students were involved in the scam, and they’ll all be retaking their exams. Some are even facing suspension or expulsion, though, in their defense, students say cheating is rampant among teens. People just care more when you attend the city’s most elite public high school, or at least, they expect you to be smarter about covering you tracks. Earlier, it was unclear if other students were active participants in the scheme, or if one student was distributing unsolicited test answers out of the goodness of his heart. The Department of Education’s investigation found that 69 students received and responded to the messages. The scandal has revived questions about whether top students are under too much pressure to earn good grades and gain admission to the Ivy League school of their parents’ dreams. However, Madeline Rivera, who graduated from Stuyvesant in June, told the New York Times that this is just a symptom of test-taking in the post-Facebook age. “I can assure you it is pretty much the same at every other high school,” she said. Administrators are still deciding whether or not to note the incident on students’ transcripts, and it’s unclear if patient zero will be forced to transfer to another school in the fall. An additional student is facing suspension for cheating by passing notes the old-fashioned way during the physics Regents exam. We say this young man deserves a pass. He’s the only one of these little hooligans who’s trying to keep the lost art of note-writing alive.